A new integrated computational climate model developed to reduce uncertainties in future climate predictions marks the first successful attempt to bridge Earth systems with energy and economic models and large-scale human impact data. 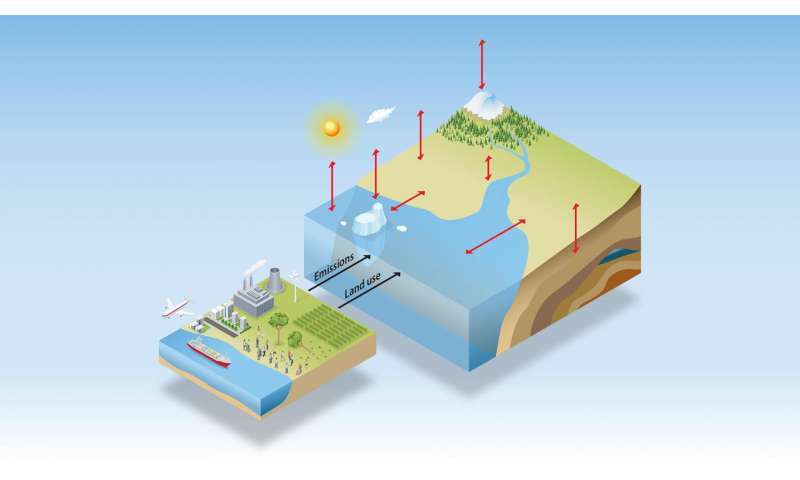 The integrated Earth System Model, or iESM, is being used to explore interactions among the physical climate system, biological components of the Earth system, and human systems. By using supercomputers such as Titan, a large multidisciplinary team of scientists led by Peter Thornton of the US Department of Energy's (DOE's) Oak Ridge National Laboratory (ORNL) had the power required to integrate massive codes that combine physical and biological processes in the Earth system with feedbacks from human activity. "The model we developed and applied couples biospheric feedbacks from oceans, atmosphere, and land with human activities, such as fossil fuel emissions, agriculture, and land use, which eliminates important sources of uncertainty from projected climate outcomes," said Thornton, leader of the Terrestrial Systems Modeling group in ORNL's Environmental Sciences Division and deputy director of ORNL's Climate Change Science Institute. Titan is a 27-petaflop Cray XK7 machine with a hybrid CPU-GPU architecture managed by the Oak Ridge Leadership Computing Facility (OLCF), a DOE Office of Science User Facility located at ORNL. Through the Advanced Scientific Computing Research Leadership Computing Challenge program, Thornton's team was awarded 85 million compute hours to improve the Accelerated Climate Modeling for Energy (ACME) effort, a project sponsored by the Earth System Modeling program within DOE's Office of Biological and Environmental Research. Currently, ACME collaborators are focused on developing an advanced climate model capable of simulating 80 years of historic and future climate variability and change in 3 weeks or less of computing effort. Now in its third year, the project has achieved several milestones—notably the development of ACME version 1 and the successful inclusion of human factors in one of its component models, the iESM. "What's unique about ACME is that it's pushing the system to a higher resolution than has been attempted before," Thornton said. "It's also pushing toward a more comprehensive simulation capability by including human dimensions and other advances, yielding the most detailed Earth system models to date." To inform its Earth system models, the climate modeling community has a long history of using integrated assessment models—frameworks for describing humanity's impact on Earth, including the source of global greenhouse gases, land use and land cover change, and other resource-related drivers of anthropogenic climate change. Until now, researchers had not been able to directly couple large-scale human activity with an Earth system model. In fact, the novel iESM could mark a new era of complex and comprehensive modeling that reduces uncertainty by incorporating immediate feedbacks to socioeconomic variables for more consistent predictions. The development of iESM started before the ACME initiative when a multilaboratory team aimed to add new human dimensions—such as how people affect the planet to produce and consume energy—to Earth system models. The model—now a part of the ACME human dimensions component—is being merged with ACME in preparation for ACME version 2. Along with iESM, the ACME team has added enhancements to the land, atmosphere, and ocean components of their code. These include a more capable framework for calculating the cyclical flow of chemical elements and compounds like carbon, nitrogen, and water in the environment. The new ACME land model includes a fully-coupled reactive transport scheme for these biogeochemical processes. This capability will provide a more consistent connection between physical (thermal and hydrologic) and biological components of the simulation. Perhaps the most significant advancement, however, is the introduction of the phosphorous cycle to the code. Phosphorous is an essential nutrient for life, moving from soil and sediment to plants and animals and back. ACME version 1 is the first global earth system model that includes this dynamic. In addition to increasing the resolution of the model, and thus estimating new parameters, ongoing tuning and optimizing of ACME has brought the team closer to reaching its 80-years-in-3-weeks simulation speed goal. With the advances, the team can now run about 3 or 4 simulated years per day, about twice the output of earlier code versions. "The overall ACME project not only involves developing these high-resolution models but also optimizing their performance on high-performance computing platforms that DOE has at its disposal—including Titan—to get to our target of 5 simulated years per day," Thornton said. Increased utilization of Titan's GPUs is helping the project reach the next level. The OLCF's Matthew Norman is working with Thornton's team to offload various parts of ACME to GPUs, which excel at quickly executing repetitive calculations. "ACME version 2 should make much more use of the GPUs to increase simulation performance, and there are other projects that are spin-off efforts using ACME that are targeting Summit [the OLCF's next leadership-class machine] and future exascale platforms," Norman said. The OLCF is continuing to assist the team with data management via advanced monitoring and workflow tool support to help reduce the amount of time researchers need to get results. OLCF staff, including liaisons Valentine Anantharaj and Norman, are also helping with various tasks like debugging, scaling, and optimizing code. "The liaisons are crucial for helping us understand where to look for problems when they arise and getting the best performance out of the Titan supercomputer," Thornton said. For iESM to take the next step, the representation of land surface between coupled models must become more consistent. The team also aims to include other dimensions, including water management and storage, agricultural productivity, and commodity pricing structures. This will yield better information about potential changes in water resource availability, allocation, and shortages under different climates. "These improvements are vital since there is concern that fresh water resources might be the pinch point that gets felt first," Thornton said. ACME version 1 will be publicly released in late-2017 for analysis and use by other researchers. Results from the model will also contribute to the Coupled Model Intercomparison Project, which provides foundational material for climate change assessment reports. Even the most sophisticated software can't compensate for GIGO.